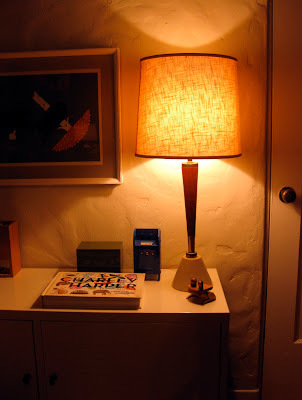 vitamini handmade: I love lamp. It has a white ceramic and teak base with brass fittings. It's 30" tall! At first I thought the shade that it came with was terrible and would have to be replaced, but it's growing on me. It needs to be cleaned, but is actually in pretty good shape. I like the cross-hatched texture, too. Not bad for $7!